Elle is featured on Miu Miu‘s Spring/Summer 2018 campaign! We have updated our gallery with the promotional images the brand has released so far. Hey guys! Our gallery has been updated with a couple of candid sets from this year. They were done in different days, but I just had time to finally make a post for them. Happy New Year, everyone! I hope you had a great break! We’re back to our normal activities now, mostly. It looks like the paparazzi worked through the weekend, so we have two new picture sets of Elle and Dakota Fanning. They were out for lunch a couple of days ago, and Elle was seen leaving a New Year’s Eve party on the 31st. The images have been added to our gallery! Another year has come to an end, and it’s time for us to go through its best moments again! In 2017, Totally Elle went through many changes – it got a new owner, new layouts and a complete revamp of its gallery and pages. It also completed 14 years online! We made over 130 posts to this fansite in 2017. The very first news we got to share were about Elle filming I Think We’re Alone Now with actor Peter Dinklage (x), in April. A few days later, A24 and DirecTV acquired the drama Sidney Hall, which had premiered in January at the Sundance Film Festival (x). Still in April, we got the official trailer for the film About Ray (x), and the official trailer for The Beguiled (x). In May, Elle became the international spokesperson for L’Oréal Paris, and attended the Cannes Film Festival, where “The Beguiled” and How To Talk To Girls At Parties premiered (x, x). Elle stars in both films with actress Nicole Kidman, and the pair posed for some very sweet pictures during the festival. In June, the official trailer for the animated movie Leap!, previously known as “Ballerina”, was released (x). This was also the month when Elle joined The Academy of Motion Picture Arts & Sciences (x). In July, Elle starred in a new campaign for Tiffany & Co. (x), and in October the international trailer for “How To Talk To Girls at Parties” was released (x). Elle attended the Toronto International Film Festival in September to promote the film Mary Shelley (x), in which she stars with actors Douglas Booth and Maisie Williams. 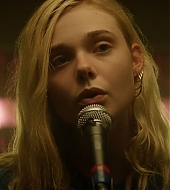 All in all, 2017 ended up being a big year for Elle’s film career. We saw the release of many more films than we had in any other year: “Sidney Hall”, “The Beguiled”, “Leap”, “How To Talk To Girls At Parties”, “Mary Shelley”, “About Ray” and “Leap!” – and she has a starring role in all of them. That, of course, meant a lot of promotion. 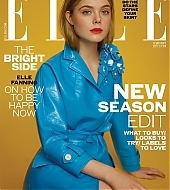 Elle got to cover big magazines, such as Elle UK, Vogue, Dazed, Grazia and L’Officiel. Besides L’Oréal Paris and Tiffany & Co., Elle also posed for Miu Miu. 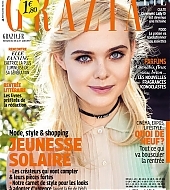 She’s featured in their Croisere 2018 campaign (x), as well as in their holiday Whispers campaign (x), which also features her sister Dakota Fanning. Elle was sighted in Los Angeles in the past couple of days! She was seen spending time with her sister Dakota Fanning and their mom Heather, and our gallery has been updated with the images. Well, props to Elle for keeping her gym game strong on the last days of the year! She was sighted again yesterday, and the images have been added to our gallery. Our gallery has been updated with candids of Elle leaving the gym in Los Angeles yesterday. Elle was photographed arriving and leaving the gym in Los Angeles yesterday. Our gallery has been updated with the images. Elle was spotted leaving the gym in Los Angeles yesterday, and the pictures have been added to our gallery. I’ve also uploaded a promotional image from Miu Miu‘s Whispers campaign!